THE REVIEW: Readers of this site will know that musicals are not my favorite genre of film and therefore should not be surprised that unlike seemingly the rest of the film world, La La Land wasn’t exactly my cup of tea. It’s not that I have a universal dislike for musicals; there’s some that I really enjoy (including Les Misérables. But in many ways I don’t see how being a musical added to La La Land and why it couldn’t just be any other actor-centered, Hollywood-is-the-best drama. Yes, yes, I know. How does a film about a jazz pianist and an aspiring actress — a film that seems destined to be a musical — not benefit from the genre? Music is a central part to the story, especially to Sebastian’s (Ryan Gosling) character. His love for jazz is what attracts Mia (Emma Stone) to him and we see Mia evolve her love for the music over the course of the film. Jazz certainly adds to the film and helps solidify the story and make it one that grips the audience, but I don’t see why impromptu song and dance are necessary. Again, most of this is just a personal taste thing. I like there to be a reason or purpose for things and besides just looking pretty and well executed (the opening number — which was used as the basis for the Golden Globes opening — is indeed fantastic). Behind that curtain though exists a truly wonderful love story, one that has ups-and-downs, its virtues and imperfections. Gosling and Stone again demonstrate perfect chemistry (seen before in Crazy, Stupid, Love. and [Gangster Squad]. They have so many great moments together, one of the best being Mia requesting “I Ran” at a pool party where Sebastian is playing piano for the cover band. 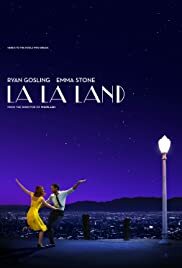 For the most part, I could watch La La Land and focus mainly on Mia and Sebastian’s relationship (the part I was fascinated with) and could mostly ignore the song and dance (which was far from my favorite aspect of the film). The result for me was decent enjoyment, but nowhere near the fervor with which others talk about the film and the number of awards being bestowed upon typical Hollywood awards-bait. Depending on how you balance and weight those two elements of the film (a great love story with terrific chemistry between Gosling and Stone and beautiful looking and well-choreographed musical numbers) your enjoyment of the film will vary. Won’t be my personal favorite for Best Picture this year, but it is sure to be a contender.